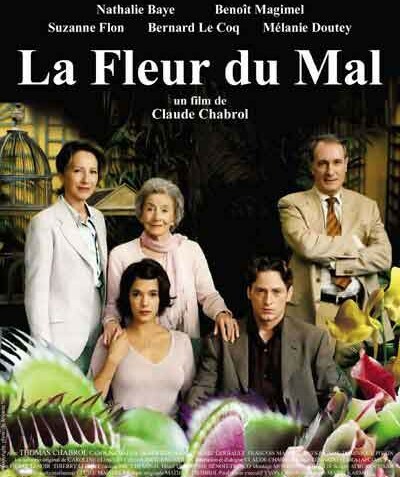 As the main titles run, director Claude Chabrol delivers a long tracking shot, his camera arriving at a Bordeaux mansion, glancing first at a maid setting the dinner table, then climbing the stairs and peering into the second floor bedrooms. In one, a woman sits on the floor, her head cast down. In another lies a bloody corpse. The opening sets a mood of mystery that is thoroughly absent from the rest of this, Chabrol’s 50th film. While the prelude was set a generation ago, it’s events are disclosed rather matter-of-factly in the course of the film, the balance of which takes place in the present. The house belongs to Aunt Line (Suzanne Flon), who, years ago, was acquitted of the murder of her father (the main title scene), a Nazi sympathizer who was involved in deporting Jews to the camps and worked against the French resistance. Line also held her father responsible for the death of her beloved brother, a member of the resistance. In addition to Aunt Line, the present day household consists of her niece, Anne (Nathalie Baye), a charming politician running for mayor of the town; her second husband, Gerard (Bernard Lecoq), a womanizer and an entrepreneur with a pharmacy and a (perhaps shady) medical lab; and Anne’s daughter by a previous marriage, Michele (Melanie Doutey), a college student. The key to what plot movement there is here is an anonymous letter that is circulated in the town, a hit-piece against Anne’s campaign which rehashes the Nazi connection and the death of Line’s father. Suspicion as to the source of the letter shifts from one character to another, exposing a general texture of distrust, even within the family. But the letter is a loose strand, really, a device for exposition of the past events (along with Aunt Line’s moments of regressing into memory). There is a climactic act of violence, but the entire situation stretches credulity and seems largely tacked on to close the pattern of family history repeating, sort of an haute bourgeois Gallic Bad Seed. Indeed, the various threads of the story never coalesce into an integral whole. Nor is there a hint of suspense or even foreboding. Chabrol might as easily have been telling about a bridge tournament as about betrayal and murder. The misdeeds of the current victim seem trivial (if reprehensible, nonetheless) compared to those of his historical counterpart, rendering the contemporary story more prosaic than profound. The observations of the mores and style of life of this group of characters, especially as contrasted with the poor folks whose votes Anne seeks, provide a modicum of interest. ("People have lived like hypocrites since the dawn of time. That’s what we call civilization.") That substance and the performances by an attractive and skilled group of actors keep the film from sinking entirely, but don’t save it from being a pale iteration of the director’s best work. Just a few years ago, Chabrol’s Merci pour le Chocolat took similar themes (confused family identities, murder in a wealthy family) and melded them into a chilling and perceptive film. Perhaps in #51, he will return to form.